As days lengthen and warm up, frosts are hopefully now a thing of the past and we can get on with the task of planting up pots and urns for the summer. Here at Deene Park we have quite a few to work on, taking several days to complete. Firstly, we remove the winter displays from our pots and urns which are by now rather past their best. Most of the plants that we remove are placed on the compost heap. However, spring bulbs such as tulips, daffodils, hyacinths and crocus can be planted out in the garden now to form part of the permanent display of spring flowering bulbs. Herbaceous perennials such as polyanthus can be saved. This can be done by either planting out permanently or planting in rows located in a shady spot for the summer and then lifted again in autumn for inclusion in the next winter display. Either way, they needn’t go to waste. If starting from scratch, place some broken clay pot or coarse gravel in the base of the container to give good drainage and fill up the remainder with a multipurpose compost. There are specialist composts available for the task that are more water retentive than general multipurpose composts, making life a little easier where watering is concerned. Garden centres and nurseries are full of a multitude of young plants specially grown for the purpose, so you’ll be spoilt for choice. Once we have planted our containers we must ensure that they remain well watered and are deadheaded regularly. This is so that we can guarantee the best display possible for the coming season. Many of the plants that we use for our pots and urns have been grown from cuttings taken last September. We have added some new plants to our display this summer. Amongst these are some very attractive Amaranthus, otherwise known as love-lies-bleeding, that we grew from seed. These will produce great long drooping tassels of red or pink flowers. 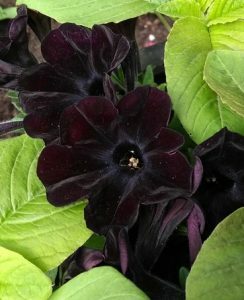 Also new this year are some very striking velvety flowered petunias. These were bought in as plants, rather than grown from seed, as seed grown plants will produce seed themselves as flowers fade. This reduces the length of the flowering season. Plants sold from nurseries and garden centres are vegetatively produced from sterile varieties that will not go to seed and therefore flower for longer. We are hoping to be able to take cuttings from them in the autumn to produce our own plants for next year. 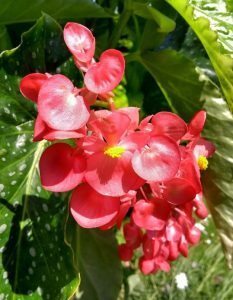 Also new this year is a tall cane begonia by the name of ‘Comte de Lesseps’, with large spotted leaves and clusters of deep pink flowers, produced along canes that can reach six feet in height. 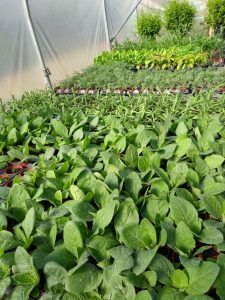 Our polytunnel is now bursting at the seams with young plants grown from seed that are now ready to go out into the garden. As forget-me-nots fade in our borders, they will be removed and replaced with annuals where gaps remain. Perennial plants will be moved out of the polytunnel, potted up and kept in cold frames to bulk up before being planted out in the autumn. Our new rose garden is well underway. 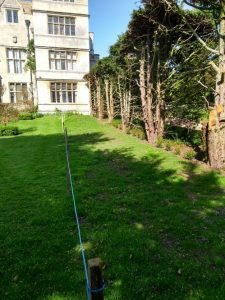 The hedge has been cut back, young yew trees have been inter-planted to aid the thickening up process and the freshly seeded grass has germinated nicely.